We explored Open Hardware and 3D printing, now it's time to play with laser cutting. 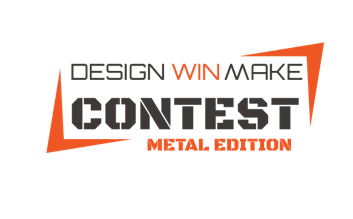 In 2015, our "traditional" product design contest DesignWinMake gets a Metal Edition for laser-cut metal products. The contest is organized by MakeTank, LaserMio laser cutting service and Arredativo.it. DesignWinMake Metal Edition is open to all European Makers and designers. It's not focused on a specific kind of product, so you can design what you like the most: jewels, furnishing complements, personal accessories and so on. You can sumit a single object or a complete product family. All submitted projects will be evaluated for their innovation, functionality, production costs and manufacturing ease. The contest jury members are Andrew Boffa (architect), Laura Calligari (Arredativo.it), Cecilia Chiarantini (IED Firenze), Laura De Benedetto (MakeTank) and Stefania Zorzan (Lasermio). DesignWinMake Metal Edition starts today. Projects must be submitted before March, 31st. The contest winner will be selected before April, 15th and the award ceremony will be held during Florence Design Week 2015 (May, 27th-31st). MakeTank, Lasermio and Arredativo.it will cover manufacturing costs for a prototype of the winning project, which will be on sale exclusively on MakeTank for the first 12 months. You can find more info about the contest and its technical specifications here.